It has happened again! I have received the Sunshine Award! I am actually quite surprised by this. Yes I have gotten a few awards on my blog in the past but man each time I receive one I am always shocked. First off let me thank Missy Frye for the nomination. My Passion: Reading and writing. Favorite pattern: That’s a tough one, I’m going to say either swirls or tribal pattern. Favorite Day of the Week: Saturday. 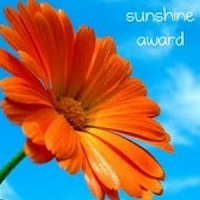 Last week I was passed the Sunshine Award by my friend, T.L Bodine. Unfortunately this came at a time when my in-laws were visiting and thus stripped me of all my privacy and my online time. So while this is a week late I am still very excited about being given this award. How the award works is this. You copy the above award picture into a post and link back to the person who gave you the award. You then must either answer 10 random questions or give 7 random facts about yourself. Then spread the award along to 10 other bloggers by tagging them! I have decided to go with seven random facts about myself instead of answering ten random questions. Why? Simply because I felt that figuring out what those ten questions would be would take far more time than I have. So random facts it is. Contrary to what many people may think about me I am quite anti-social and tend to avoid people at all costs. If it weren’t for Dr. Pepper I would struggle to make it through each and every day. It is my drug and I am very much addicted to it. I spend more hours in front of the computer each day than I care to admit to. If you are looking for an exact number I would say about 14 hours if not more. Sad but true. I have over 100 horse figurines and models around my desk area. If I could do anything in the world and not have to worry about income or other responsibilities at that time I would follow the rodeo circuit for an entire year, going to every single rodeo I could get to in that time. After two years of owning it, I still dislike my Kindle. I will explain the reasons why in a future post. I start way too many projects than I will ever be able to finish at one time, thus I am forced to abandon most of them so I can get a single one done. From what I understand this is a trait that most Gemini have. There we have it, seven random facts. I almost did more but stopped myself so that I didn’t exhaust all my effort on that and have nothing left for the remainder of the post. Now onto passing on this award to others. I will do my best to list ten different people, however my blog stalking abilities are not what they have been in the past so I may or may not reach that goal. Well I almost made it to ten. I tried but just couldn’t reach that goal. Still, I got over half way to ten so that’s pretty darned good in my book.